Acknowledged author wrote BIOENGINEERING FUNDAMENTALS 2 comprising 624 pages back in 2016. Textbook and etextbook are published under ISBN 0134637437 and 9780134637433. 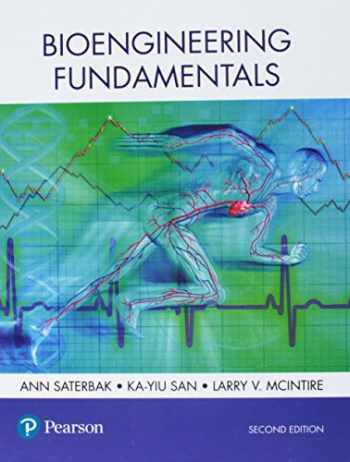 Since then BIOENGINEERING FUNDAMENTALS 2 textbook received total rating of 4 stars and was available to sell back to BooksRun online for the top buyback price of $91.13 or rent at the marketplace. For sophomore-level courses in Bioengineering, Biomedical Engineering, and related fields. A unifying, interdisciplinary approach to the fundamentals of bioengineering Now in its 2nd Edition, Bioengineering Fundamentals combines engineering principles with technical rigor and a problem-solving focus, ultimately taking a unifying, interdisciplinary approach to the conservation laws that form the foundation of bioengineering: mass, energy, charge, and momentum. The text emphasizes fundamental concepts, practical skill development, and problem-solving strategies while incorporating a wide array of examples and case studies. This 2nd Edition has been updated and expanded with new and clarified content, plus new homework and example problems.